So my husband was in charge of refreshments at the youth activity this week at church and since he was helping me with a client’s custom WordPress install and website, I pitched in and helped him with the food and drink. Since I recently have been working to help a party goods designer (more announcements and info to come on that later! 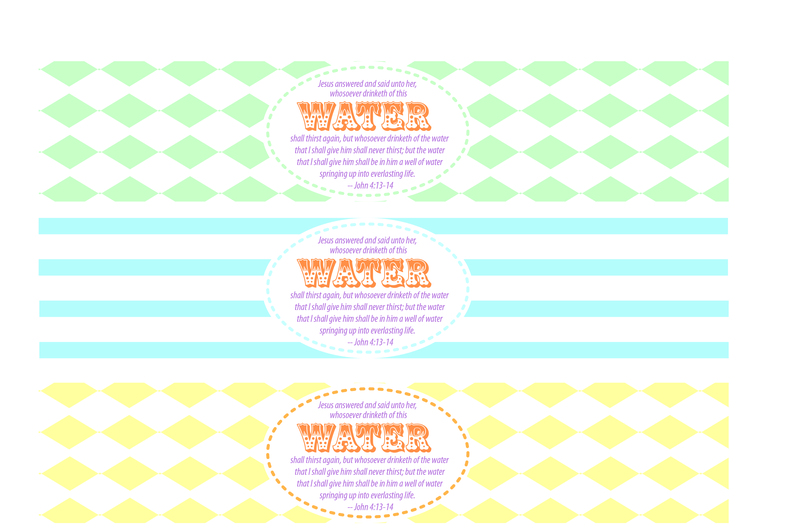 ), I knew I could quickly throw together a water label with a fitting scripture: John 4:13-14. 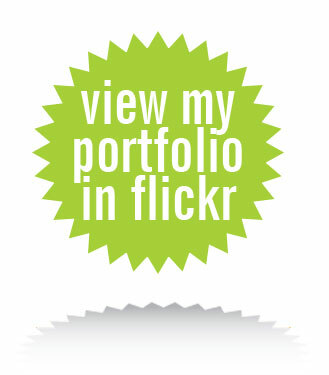 Free jpg file for download here. You will want to use packing tape to adhere them to the water bottle. I found the easiest way was to remove the official label off the bottle, stretch out a piece of packing tape a little longer than your new label and center it on your tape and wrap it around each bottle – voila! So cute. I think I’ll have to use this for seminary, too. Can you email me this label? Absolutely Shasta! I’ll send it now! Glad you like it. I tried printing it and it came out tiny. Tried saving it, and that didn’t work either. Can you email it to me please??? Sure! Send me an email at liz@sparkbark.com and I’ll email it to you now! Could you email it to me too! Did you print it out on regular paper or card stock? Could you email this to me, please? I would love to use it for a children’s church lesson! Thanks! Looking to do the same thing for our youth mission trip. 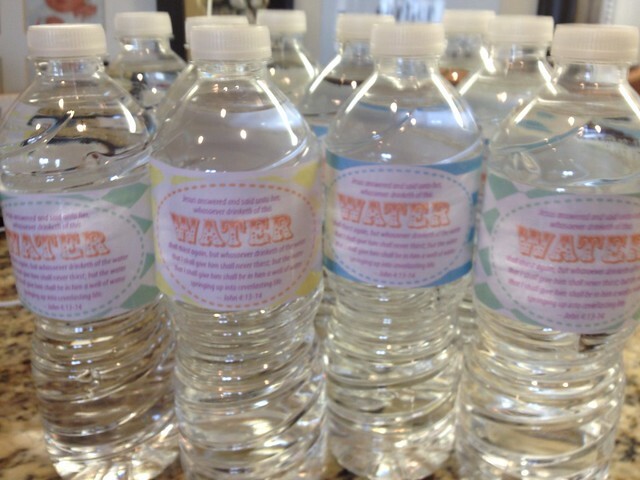 Could you please advise….Were your labels waterproof labels? and could you send me the file for printing. We want to put them on the little 8oz. Deer park Water bottles. so what size are the labels printed ex. 1 1/2 x 4 or 6? Thanks for your help. Hi, Paul – I have printed this exact size on large and small water bottles; I just cut the ones for the smaller bottles so they weren’t quite as long. They are only waterproof depending on the type of printer you use. Since I use regular paper, technically it’s not water proof even though I use laser printing that won’t run. HOWEVER, the way I put them on is to lay them down facing up on a table after they are cut out and then place a short length of packing tape over the label and wrap it around the bottle. If prepared this way, they almost look laminated by the packing tape…make sense? Would you be able to email this file to me. I love it! Sue thing, Ericka! I’ll send today. Will you please email the water labels to me also? I love these!! Thank you so much!! Will do later today…, thx Kim! Can i have a email to prints labels. thanks and God Bless you!!!! Sure thing! I’ll send them to your email address now. Happy Sabbath! Can you email this to me? Thanks! Of course I wait until the last minute to try and come up with a handout for my class. If you read this at all this morning could you please send me the link? Thank you! Could you email me this file, please? I want to use it for my lesson this Sunday. Thanks! Please email me this. 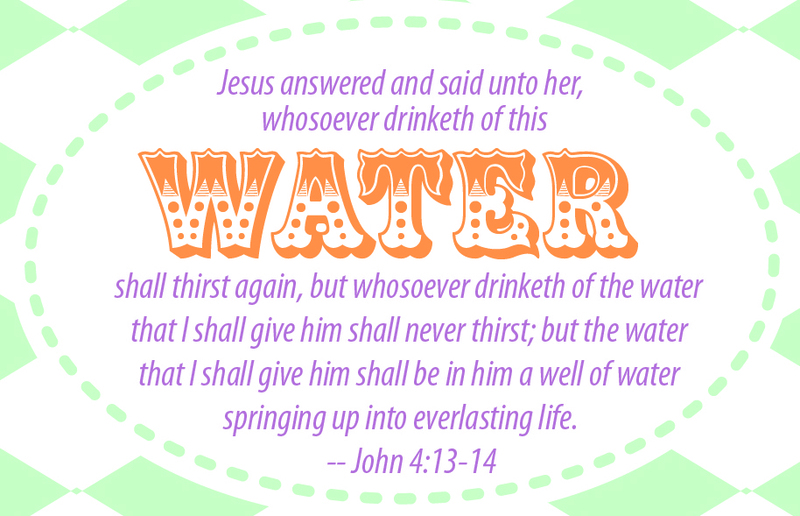 I am looking for water bottle designs for outreach. Thank you. Could you please email the template. We would love to use this for our girls camp. Thank you so much! I love your work. Just sent! Have fun at camp!! Sent last week – sorry I didn’t see your request sooner! I would love this! Thanks for making this! Could I use this for a church function please? Thank you! !